This is a tomb for bees, can you tell? Children constantly remind me that I have grown too callous as I age, and that I move too fast as life goes on. Here is that lesson again. Jesse dumped the thousands of bees from our hive that died into the blackberry hedge to decompose and perhaps offer something worthwhile to the plants there. Being the eagle-eye that my R is, she spotted them despite their camouflaged color against the still-brown of early Spring. I guess she figured the heap was sacrilege… Together with some dear friends of hers, they dug a proper grave, scooped and scooped thousands of bees into buckets and buried them, covering the spot with shredded grass and “the purple creeping charlie flowers.” On her own, she placed a large rock, found some permanent markers and wrote a single colorful word that to a 6 year-old means more than it appears to us ignorant adults. When asked about her choice of location under the pear tree, in the corner between the chicken run and chicken coop, she said she wanted them to have a bit of privacy. Thoughtful as ever, my girl. Well, now it is quite a lovely place to go give thanks for the honey left behind in their premature death and to reflect on this overwhelming journey of beekeeping. I think I say that every time I write a post about the honeybees. Next month will officially be one year of having honeybees in our backyard and I have to say that I am not all that more sure of myself, or them. There are so many things to look for, so many things that can go wrong and it seems to take a trained eye to really notice or anticipate it all. There are several different ways to solve every single issue, five different ways to do “the right thing” if you ask five different beekeepers. We began our journey with no drawn comb, and a late install of two packages. We were excited that despite the setbacks, one of the hives survived our MN winter. That hive is going strong as we enter into a new phase of managing a second-year hive. Let the learning curve continue! I am often asked why one of our hives died. Good question! But I’m finding it one that is difficult to answer. The honeybee hive survival rate isn’t stellar, so we were not surprised (especially as we are newbies), but we were still sad to lose that many bees. It was a very harrowing experience to open up the hive and witness so much death. 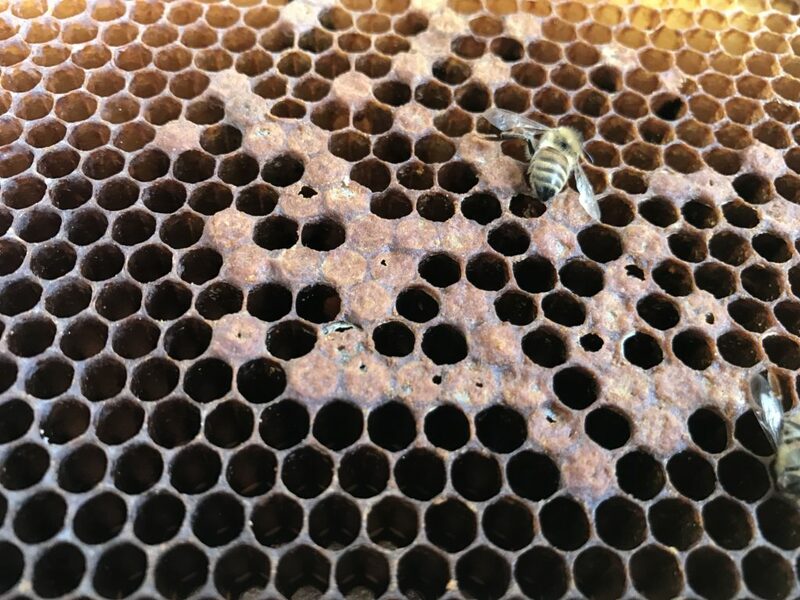 In this post, I’m going to share a bit of what we saw when we finally opened the dead hive. If any experienced beekeepers have thoughts, do please speak up in the comments section! 1. Our first view when opening the hive confirmed there was no life, but we expected as much given the lack of activity at the hive entrance. We also noticed a few drops of moisture here, despite using a moisture board. However, this could also have developed from the freeze and thaw once the hive was dead. 2. Next, we removed a couple frames to stare down at a sad, sad sight. 3. 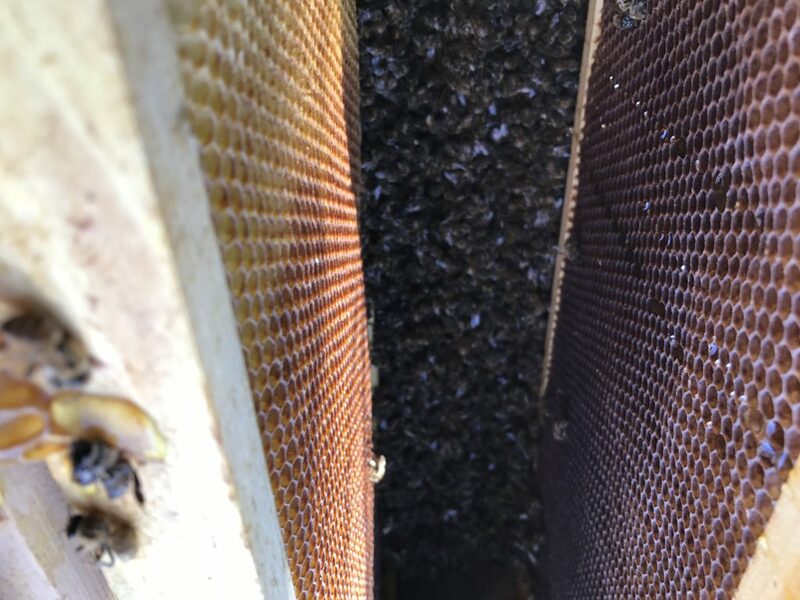 We pulled a frame out and found where the winter bee cluster was located. 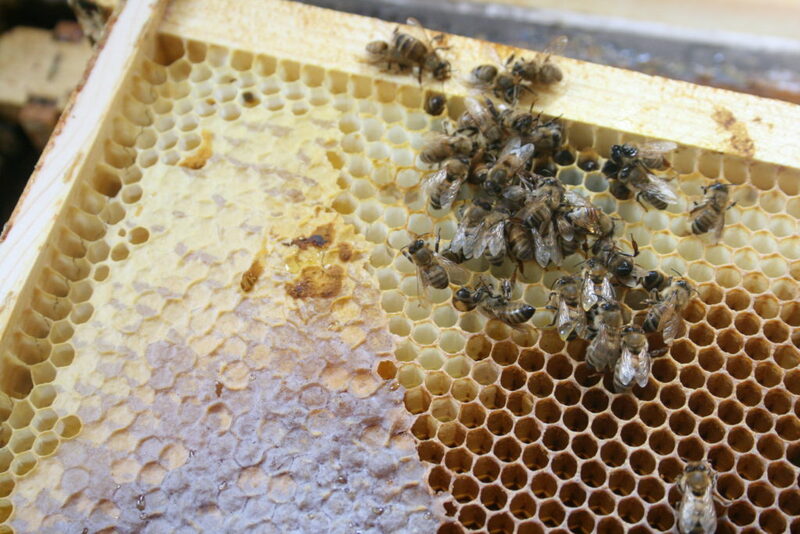 This photo shows the remainder of the cluster and its position right next to some capped honey. It seems hard to believe the cause of death was starvation.We suspect that the hive died fairly early on in the season as there were frames still completely full of honey. As I mentioned in this post, it seems they were robbed in Fall (a bit of sad news for the beekeeper, but awesome photos, so please check it out!) Since they didn’t have a ton of extra honey to begin with, seeing what was left behind after their death made us feel they didn’t eat much of their honey stores. 4. There was also still unhatched brood in the hive. I think this could be an indication that the hive died early in the season, as well. 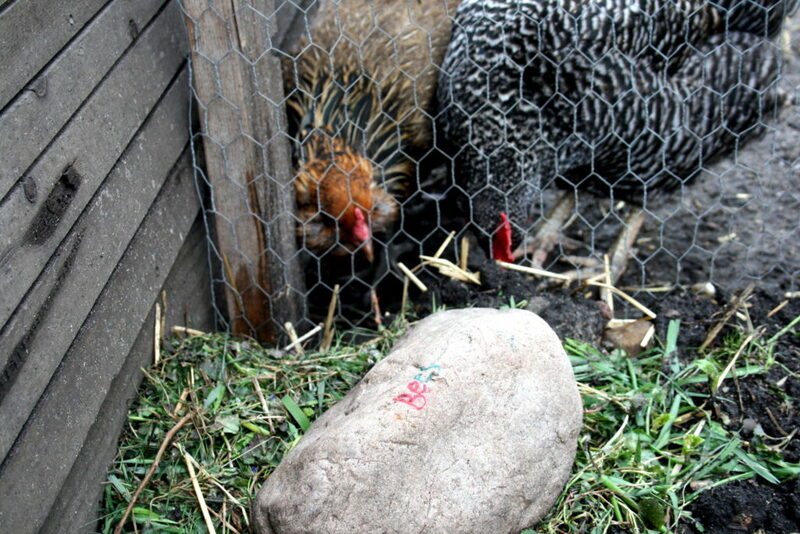 It is my understanding that brood does not overwinter. Can any experts confirm that? We took note of the porous cappings on the brood, which can be an indication of foul brood disease. However, the hive didn’t have an awful smell that I read is associated with foul brood, so we didn’t think that was the cause of death. Perhaps the perforations were just bees beginning to chew out of their cell when they died? Also, seeing the brood discounts the possibility of a Fall swarm that I threw out in this post, right? I think that if the queen had swarmed with a group of bees, there would be no brood. 5. 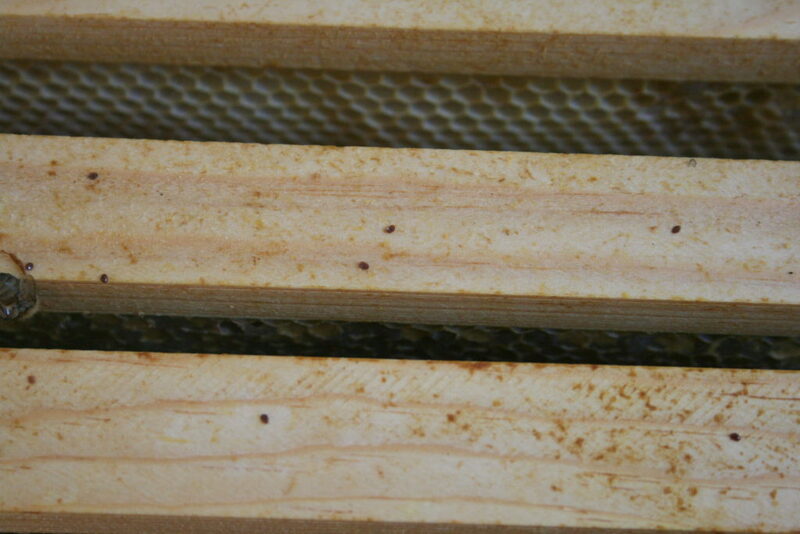 As we were moving frames around in the dead hive, some varroa mites fell from a frame, as shown in this photo. These are a huge threat to the honeybee, so their presence is quite likely a factor in our hive’s death. We saw several, but not tens, so I am unsure if the mites we saw could be considered normal, or the cause of their death. Most beekeepers test for mites in preparation for the winter season. We did so and had excellent counts. However, we had some uncharacteristically warm weather in late Fall. According to this local, expert opinion, the warm Fall weather increased our mite count as we headed into winter. 6. No beekeeper wants to see this on their bottom board. 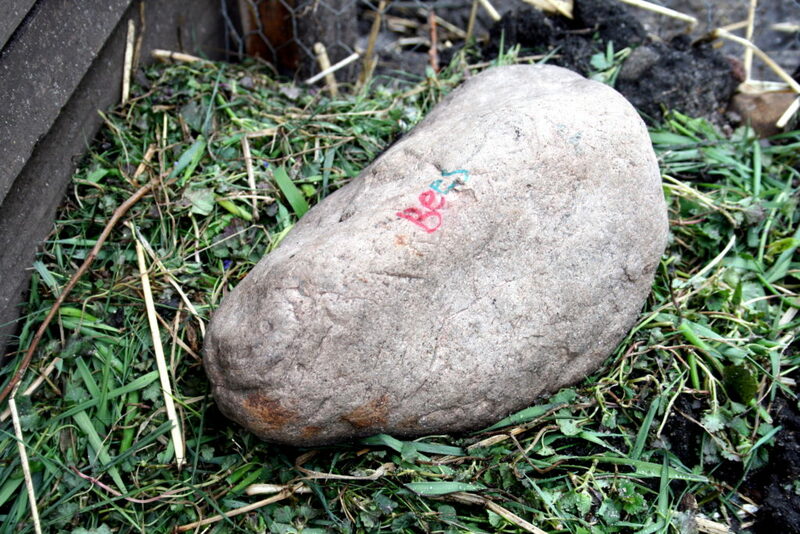 I am glad R gave them a proper burial. The honey stores that were left behind and the capped brood indicate to me that the hive died early on in the season. 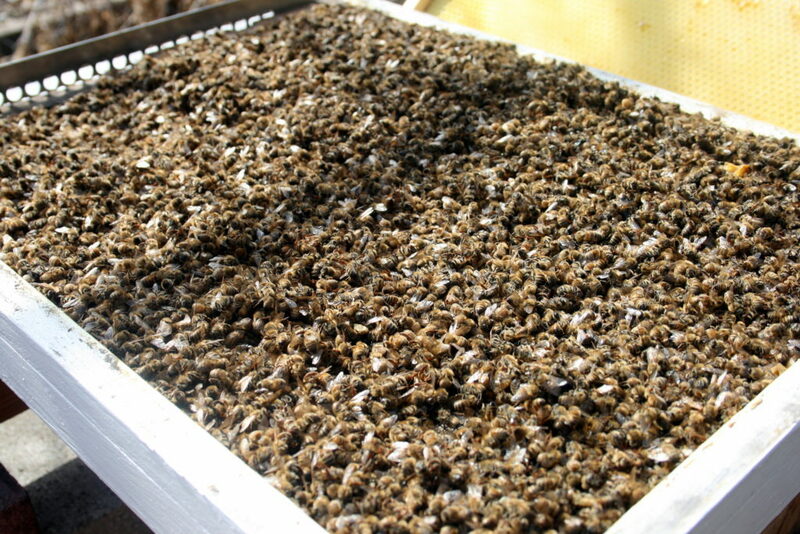 We also noticed that there were dozens of bees that were spread around the hive, away from the winter cluster. They usually cluster if it’s cold, so perhaps the spread-out bees indicate that it was warm and they thought they were safe to break the cluster? 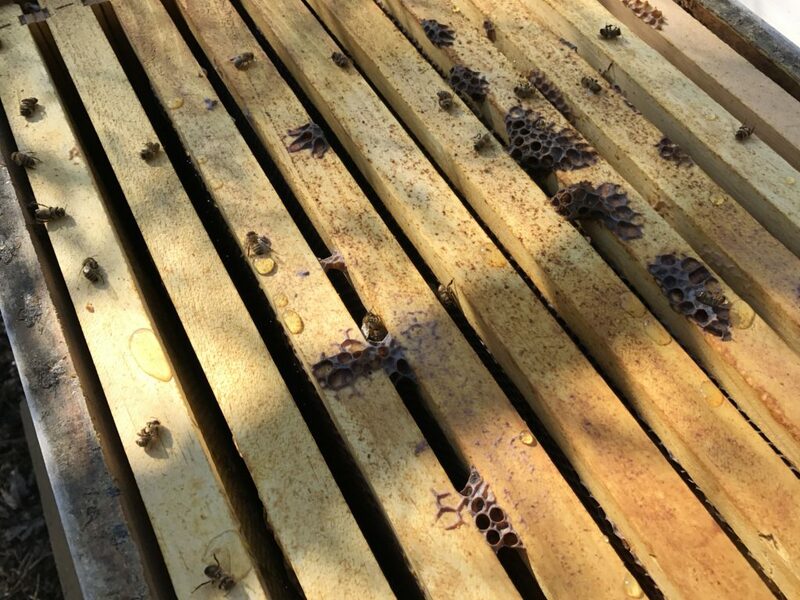 With these things combined, my newbie hypothesis is that this hive died as early as late November due to our crazy MN Fall weather – uncharacteristically warm temps, followed by an unanticipated cold snap. What do you think? 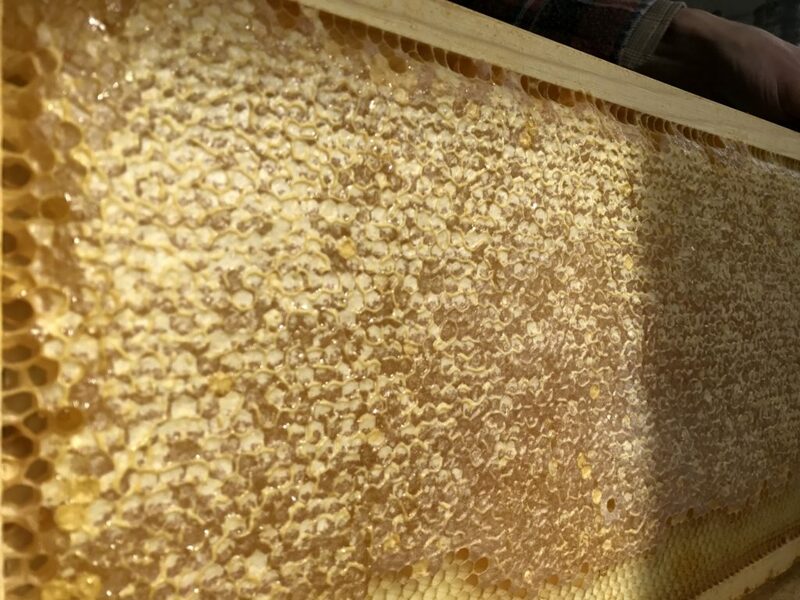 Here’s our first post-winter peek into the hive that survived. What a contrast to hear and watch the buzz of life! 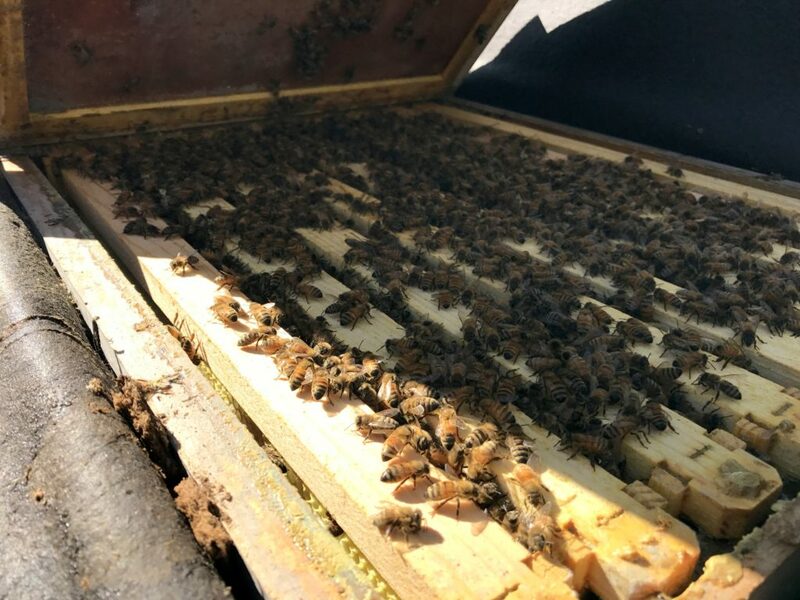 We’re feeling really grateful that these ladies survived and are looking forward to learning how to manage a second year hive. Again, please share your thoughts, experience, ideas and questions in the comments!